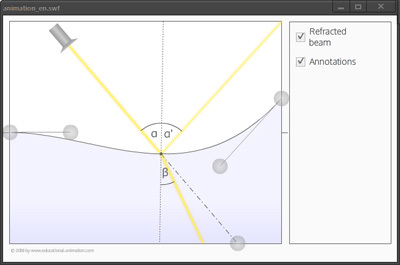 This interactive animation on the “law of reflection” illustrates the geometric relationships between the angle of incidence and the angle of reflection. Tip: You can use the mouse to move the spotlight. The gray dots are also adjustable. The animation shows a spotlight illuminating a surface. The shape of the surface, the position of the beam and the orientation of the ray can be modified. Depending on the angle of incidence, the light beam (in accordance with the low of “angle of incidence = angle of refection") is reflected in a different way. To clarify the law of reflection, the labels of the angels can be clicked and displayed. In this case the angle of incidence, the angle of reflection and a perpendicular line are depicted. Just in case a partially transparent medium is used, a fractured light beam is also shown. You can change the shape of the surface interactively with your mouse. In addition to a flat surface, different curved and wavy surfaces can also be formed. The light source is represented by a light-ray. Both the position of the light source and the target point of the light beam can be moved by using your mouse. Just click on any selected point. Note: The direction of the rays can be adjusted by moving the gray dot on the lower side of the rectangle. The ray will then be focused on this spot. All interactions in the animation adapt seamless and in real time. This also applies to all indicators and labels. In addition to the angle of reflection, a refraction angle is also shown.